Make sure your birdhouses are in place well before the breeding season begins. Don’t be discouraged if the birds do not begin nesting in your box immediately; sometimes it takes time for the birds to find it. * In the south, place your birdhouses by February. * In northern regions, place your birdhouses by mid to late March. If you are looking to attract a variety of species to your nest boxes and have ample room, you might consider pairing your boxes. This involves placing boxes in pairs on poles 15 to 25 feet apart; or you can put two boxes, back to back, on a single pole. Birds such as Tree Swallows and bluebirds will nest closely to one another, although conspecifics will be driven away. Pairing boxes has the advantage of allowing more birds of both species to coexist peacefully within the same habitat. Golf courses, cultivated fields, gardens, and yards are great habitats for nest boxes, but avoid areas where pesticides and herbicides are used. These agents are not only harmful to birds, they decrease and sometimes eliminate insect populations—the primary food source for many cavity-nesting species. Whichever method you choose to erect your boxes, be sure your box is secure enough to withstand high winds and severe weather. 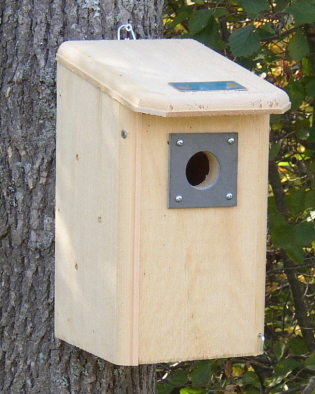 * Nest boxes can be mounted higher than when mounted on a fence post. * Many predators find poles difficult to climb. * Poles can also be easily equipped with a predator guard. open field or lawn; orchards; open, rural country with scattered trees and low or sparse ground cover; Mountain and Western bluebirds will also use deciduous and coniferous forest edges; entrance hole should face open field, preferring east, north, south, and then west facing directions.